When one arrives at a new fieldsite, the only things one can know with any certainty are the changes in one’s own experience. Lacunas of knowledge burst into one’s consciouness like the appearance of crystal-clear lakes dotting the ground when viewed from an airplane. The sprawling complexity of a landscape simplifies to valleys of ignorance and peaks of impressions that lie waiting to be remapped into a coherent whole- or else the whole land will remain unknown and passed over by you. I arrived in La Paz, Bolivia, the world’s highest capital city (11,000 feet) and a sprawling metropolis in one of Latin America’s poorest countries, in mid-June. I am here for three months to work on language training and conduct preliminary dissertation research, to be continued in earnest several months later. I have not arrived emptyhanded. Besides two giant suitcases of research materials and warm clothing (winter in the South American Andes chills to the bone, despite dermis-scalding heat during the day from a sun hanging merely feet above you), I come bearing a rather incongruous amount of ideas and questions. Having spent the past three years completing stateside research projects and anthropological theory courses, I am inclined to throw myself at my fieldsite like an overeager lover. Here is what I want to know: How do people in the predominantly indigenous area of La Paz think about, attribute, and cope with chronic bodily pain? While not as well-known as the traditions of medicine in China or India, the Andes region, with its deeply indigenous history, has an ancient tradition of medicine all its own. Andean medicine is rooted in Andean cosmology, which is a circular and holistic system focused on the interrelatedness of person and environment. Regarding bodily health, Andean thought traditionally considers a person’s body in relation to the spirits that occupy each mountain and feature of the land, as well as in relation to other people (both those alive and those within the ancestral spirit world). Herbal knowledge and practices of divination feature prominently. I was drawn to this area because these holistic traditions of medicine, still a strong presence even in urban areas, stand in sharp contrast to the U.S. biomedical tradition that I have studied the past few years. In U.S. biomedicine, mind and body are considered separate realms, and material evidence of bodily dysfunction is paramount in receiving attention, care, and the hope of relief. Thus, by examining the problem of chronic pain in these two very different settings, I hope to shed light on the tacit assumptions of both cultures regarding the social status of people in pain, the moral dimensions of suffering and of attaining (or not) healing, and how these cultural frameworks affect the lived trajectories of people with chronic pain. Masses of theoretical preparation, however, leave me only more aware of my clumsiness when approaching this singular, living and breathing, place: La Paz. La Paz is its own entity- pulsating, mysterious, self-contained- and she has no obligation to entertain my shy questions. The courting process of this place will be long. Thus, I work to educate myself on the topics people are actually discussing here. I read the daily papers and learn the recent history of the socialist (and first indigenous) president Evo Morales. I struggle through hours of daily classes in Aymara, a local indigenous language (over 60% of the population of Bolivia self-identifies as indigenous, and La Paz is considered the Aymara capital of the world), learning much more prosaic questions such as “How much are those oranges?” and the various words for animal dung (thaxa, llama dung, is most revered, in case you were wondering) and all of the specialized uses of said dung. Constantly, I think about the things I do and do not know, and how they are literally re-shaping my sense of myself. The most basic moments of personal space and privacy that I have always taken for granted, have been mischievously rearranged. No longer do I stumble out of my bed in the morning to eat a bowl of oatmeal while checking my email; instead at first rise I sit myself around a table with my host family and strain my brain to decipher the rapid-fire speech, or even to participate once the first cup of wretched Nescafe begins to clear my morning fog. When I leave the house at night, I am subject to being grabbed and having my head flipped over while my “mother” grabs her blowdryer and dries my hair to her standards; it is not acceptable to leave the house in this winter weather with half-dried hair, as the cold will undoubtedly enter the body quickly and cause illness. There are many moments of regression to social childhood like this, both the overt blowdryer-type ones and the constant nagging awareness of insufficiency at the business of caring for myself. Temperamentally, this is a challenge. And yet, there are small moments of success. Late one day, unused to a full household of people and constant motion, I find a quiet bench in a sunny park where I sit to watch children scamper over a playground. I am quickly reminded that even the simple choice to sit alone here, under the spotlight of my pale skin, does not belong solely to me. A small boy, a lustrabota (shoe-shiner) approaches me and we begin a lively back-and-forth about the necessity of having clean shoes. While I fully concede his point that mine are dirty, we are less in agreement about the undesirability of this state, and even less so about the monetary value of remedying the situation. (I’m a sweatshirt-wearing grad student; who cares?) I concede, of course, to a shoeshine after realizing that I am sitting in front of the boy eating a scoop of gelato, an undeniable luxury item. But at least my recent inquiries about this particular job (there is a huge number of lustrabotas in Bolivian cities- they are generally young men and children who are working to pay for school or other basic expenses), allows me to understand the situation and his remarkable persistence for this foreigner’s shoes. It also allows me to pay the culturally appropriate price for his service, rather than the fourfold “tourist” price initially demanded. I consider this a draw, in my daily learning game: the price of an unneeded shoeshine for a semi-competent cultural encounter. Recently, I had my coca leaves read. (Coca is one of the most important plants in Andean culture, revered for its ability to give energy and suppress hunger, and for its medicinal and spiritual uses.) I was walking around El Alto, a deeply indigenous area around La Paz. Here there are many traditional healers, and I was exploring a long street lined with the small blue huts of curanderos (“curers”) and yatiris (literally, “one who knows,” from the Aymara verb “to know,” yatiña). Curious about the practices inside these little huts, I stopped at one whose sign read “Maestro curandero,” followed by a long list of his services and skills. Greeting the middle-aged man inside, I chose the most basic service- a reading of my coca leaves, to advise me about my future. I asked for advice about working in Bolivia and about which research questions, of the many interesting medical issues I’m discovering, to focus on. He tossed coca leaves over the table and examined the patterns in which they fell. Occasionally he selected specific leaves to arrange in front of him, murmuring to himself as he did so. My questions, regrettably, were not answered nearly as specifically as I would have liked. But the overall message was positive: Bolivia will be good to me, he foresaw. I will have success here. All this came, however, with the repeated caveat: Conpaciencia. “With patience.” Not right away. But eventually… yes. Con paciencia. Perhaps, as a response to my questions about the future, such an answer is a total cop-out. (Do people with abundant patience often try to read into the future?) Perhaps it is just solid advice for beginning in the field. I am certain at least of the latter. Abbe Rose Kopra is a doctoral student at the University of Chicago, studying medical and psychological anthropology in the interdisciplinary Department of Comparative Human Development. Her research focuses on the problem of chronic pain; she is interested in cultural interpretations and attributions for chronic pain, how individuals cope psychologically with chronic pain, and the connection between the two. 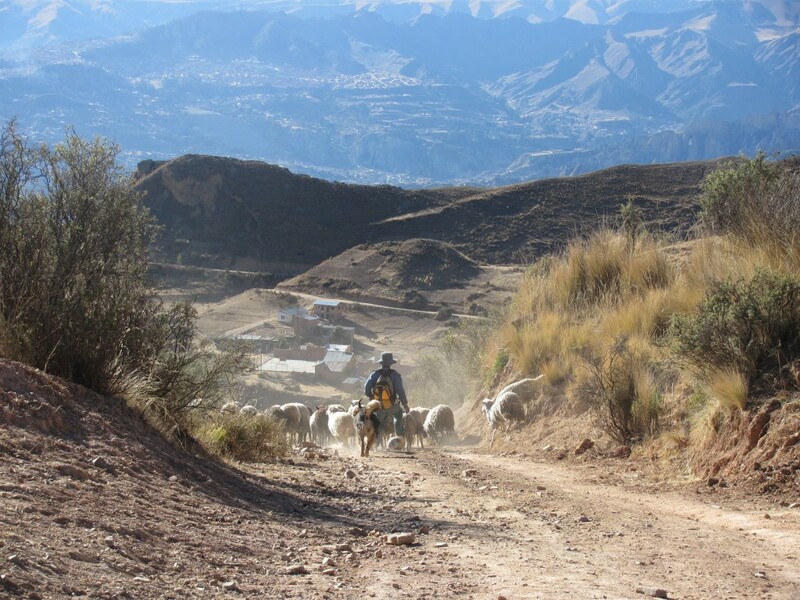 She is currently spending the summer in the Bolivian Andes, studying the language of Aymara and doing preliminary research for her dissertation fieldwork next year. This is her first summer in her chosen field site, and here she reflects about different aspects of the experience in a series of essays for Anthropology Now's 'Fieldnotes' category. This entry was posted in Fieldnotes and tagged Bolivia, chronic bodily pain, fieldwork, indigenous medicine, La Paz, language training, medical anthropology.